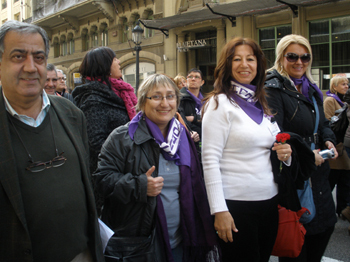 Jaida Zo’obi, In charge of Women capacity building in The Workers Advice Center (WAC-Ma’an) participated in events to celebrate International Women Day in Barcelona and its regions. 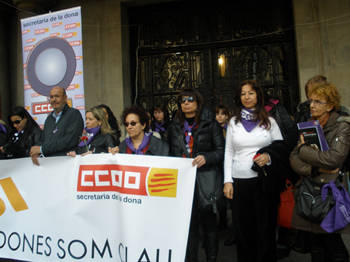 Jaida was invited by Fundacion Pau I Solidaritat –CCOO, and took part in several meetings as well as the main march of FPS-CCOO. For the event this year FPS initiated a film featuring stories of women and employment from the Balkans, Latin America, Egypt and Israel. The Israeli 10 minute film, called “Its Your Last Day at Work” and produced for WAC by Video 48, focuses on Arab female agricultural workers who suffer from the scarcity of work and its unstable and seasonal nature. The film project was financed by the ACCD (Catalan Agency For Development). In the different meetings Jaida talked about the empowerment Arab women go through with WAC, as they change their role in society from passive to active women. The employment project of WAC aims to get more and more women into the work cycle in order to reduce poverty and empower them in society. So far WAC has integrated thousands of women in jobs.